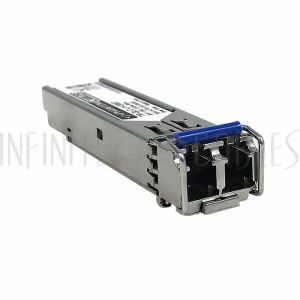 Small Form-factor Pluggable (SFP) is a transceiver module. There is an array of SFPs with different data rate from 10Mbps to 100Gbps and compatible with different media such as copper, multimode fiber or singlemode fiber. They plug into the SFP port of a device such as a network switch. 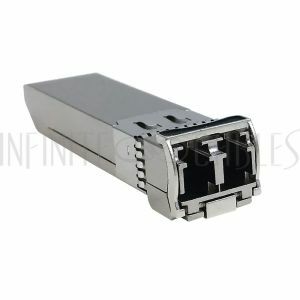 This allows the user to easily adapt to the network environment by choosing the appropriate SFP. In regards to SFPs, the main reason for choosing one type of fiber over the other is the maximum distance between two devices. Generally, if the distance between the devices is greater than 300 meters, singlemode would be the type fiber to use. If you are not sure which SFP to purchase or the brand of device is not listed please contact our sales department for assistance. Multi-Source Agreement (MSA) standards for SFPs are standards which multiple organizations, including manufacturers, collaboratively design and develop. The MSA standard provides all the specifications of the SFP such as mechanical, electrical, address parameter definition, etc. Our SFPs are MSA compliant and built to OEM specification. Digital Diagnostics Monitoring (DDM) or Digital Optical Monitoring (DOM) is a technology incorporated in some SFPs allowing users to monitor, in real-time, certain parameters of the module. This tool provides information about optical input/output power, temperature, voltage, etc. All of the SFPs that we sell have DDM/DOM support.